Have you ever asked “How can i get healthier hair?” Have you always wanted beautiful, healthy hair, but couldn’t quite manage it? You’re not alone. In fact there could be an easy reason for it. Good hair products and outstanding haircuts can only go so far without the correct nutrition. Your hair is treated as a low priority by the body, as it performs no real function when it comes to keeping us alive, so your hair only gets the leftover nutrients in your system once your organs are done with them. This is important to know, because it means that if you want strong, healthy, and beautiful hair year round, you need to be eating healthy all of the time. So let’s take a look at some of the essential foods you can eat to improve the look and feel of your hair. Salmon If there’s one thing we all know about salmon, it’s that its full of Omega 3 fatty acids, but did you know that those fatty acids are essential to bringing a healthy shine and fullness to your hair? In fact, your hair needs Omega 3 just to grow. In light of this, it’s important that you get as much Omega 3 as possible, either through fatty fish like salmon or mackerel, or through supplementation. Remember, your vital organs will take all the Omega 3 it needs before your hair gets the benefits, so ensure a couple of portions of fish a week for the best results. Please note that the Salmon MUST be wild caught and farm raised. Farmed raised Salmon have seven times the levels of PCB’s as wild salmon, are fed chemicals to give them color, are administered antibiotics at higher levels than any other livestock, and have less omega 3’s due to lack of wild diet. Spinach & Kale Leafy greens come rich in many nutrients, including Vitamins A and C, folate, beta-carotene, and iron. These nutrients work in unison to keep your hair hydrated, so that it doesn’t grow dry and brittle. If you always suffer from split ends, a lack of leafy greens may be to blame! To counter this, add some leafy greens to one or more of your meals everyday, and watch as your hair and scalp become healthier, less dry and overall better to look at. Vitamin C Vitamin C, found in citric fruits such as oranges, lemons and limes, are vital to protecting your hair from unwanted breakage. Try drinking a litre of water with the juice from 1 lemon in the morning, and feel yourself more energised than you could ever be through tea or coffee. And then, as your vitamin C levels increase on a daily basis, enjoy the benefits of a beautiful, protected head of hair. Protein Vital to nearly every system in your body, protein is essential for a thick, flowing mane. It’s hard to not know that protein is essential for building and repairing muscle, restricting fat gain, and increasing satisfaction during meals, but it’s hair benefits are often overlooked. For a healthy dose of protein, eat lean meats like chicken and turkey breasts. Peas, lentils, nuts and fish are also full of protein, and come alongside some of the other nutrients in this list. It’s an overall healthy diet, with a variety of fruits, vegetables and meats, that can really help to turn around not only your hair, but your everyday life and longevity. For a happy, healthy, and beautiful body inside and out, focus on the diet alongside the pampering. I guarantee you’ll feel great for it! Find out more information about us in our video and picture galleries. Read about industry news and trends on our blog or what’s new at Aurelio Salon including events and rewards customer can receive Give the gift of beauty to Aurelio Salon (Voted New Jerseys Best Salon*). Gift cards are available in any denominations. Call Aurelio Salon in Howell at 732-303-0052 or 732-551-2930 in Toms River New Jersey for more information about eating for healthy hair. If you are a girl, like me and you are about taking off for a quick weekend at the beach, you don’t want to end up finally missing out on that one important item when packing. It drives me nuts when I do. I don’t know about you. Clothing: A pair of pajamas, A pair of nice sandals, A beach cover-up, 2 bathing suits (to make sure you’ll have a dry one all the time), 2 tops for day, 2 tops for night, A pair of shorts, A skirt/slack, A pair of jeans, A cardigan (for those chilly sea breezes), Adequate undergarments to get you through the weekend. Beach Bag Essentials: A beach bag with a enough space, that favorite sunglass of yours (you should have one), A beach hat (I like them with flowers), 1 book and some paperbacks (If you are the reading type, like me), Camera (including your chargers and extra batteries), Beach Towel, Some snacks and water. Make sure you are drinking plenty of water so you do not get dehydrated! Toiletries: Sleeping Kit (alarm clock, eye mask etc. ), Toothbrush, Toothpaste, Razor, Shampoo (I like the “Moist Repair shampoo and conditioner” a hydrating shampoo, ideal for dry or damaged hair for laying out in the sun from KMS CaliforniaJ), Extra hair barrettes and ties, Deodorant, Medications (birth control, Aspirin etc.). Haircare: If this is your first visit to the beach the change in climate will surprise you! You are going to need astyling product, hair spray, I use all KMS products. I like Playable Texture for my styling product it builds texture with additional applications. Lets you re-work a style any time you like. Leaves hair feeling natural, not sticky. All you do is spray Spray into dry hair for light, airy texture and to accentuate layers. For a Hairspray I recommend 2-in-1 styling + finishing spray it’s a straightening and curling spray for dry hair. Just spray on dry hair before using hot tools. For best results, spray section by section. Spray again as a final step to hold the style. I will use their Anti-humidity seal it’s a 24-hour humidity-blocking formula. Shields hair from frizz. Provides a shiny, weightless finish. Provides heat protection. Perfect for the Beach. You’re going to need humidity resistant haircare for your hair. Believe me; you don’t want to leave this one out. Makeup:With your yellowish brown look, you don’t need much make-up to really make yourself noticed. Keep it natural. Make sure you have a cleanser, moisturizer, and solar defense booster (contains SPF 50). For coverage your favorite tint and concealer and bronzer. 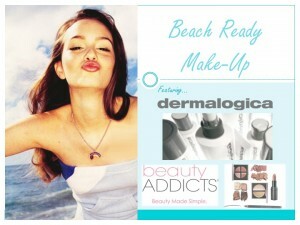 Read our Beach Reach Ready Makeup Blog for more info based on skin type and some great tips!. Go with a comparable range of natural color make-up items like; blush, mascara, eye shadow and lip gloss. If you want beachy wave type hair you might want to follow this style equation from the team at Aurelio Salon! Shampoo, conditioner is optional, then comb out. Spray with KMS Sea Salt spray followed with 2-in-1 styling + finishing spray. Use fingers to blow hair dry up to 80% or let dry in the sun, Spray hair again with sea salt spray, Continue to dry with fingers until 100% dry. Take 2-3 inch sections and wand the hair. Leave 1-2 inches of the ends kicked out for a natural beach wave. Run fingers through and spray with KMS 2 in 1 hair spray for a light hold. Now, you have it! A custom check-list made for you for that quick beach-weekend get-away. All you need do now is, whenever you are ready for that weekend on the beach, just grab your pen and start ticking them off. Don’t leave anything out! Whether it’s conserving water, dreading washing and styling your own hair, or just no time to wash your hair here are some creative styles from Aurelio Salon! Depending on the length of your hair you may have to wake up one to two hours early just to get your desired look. What if someone told you by using certian products you would only have to wash your hair once every 5 days! Try these 5 different Updo Styles. Makeover Spray absorbs oil to refresh limp hair and add’s texture for your second day hair. It’s a great way to touch up your hair in-between shampoos! Using a wand, wave the top part of your hair. Using bobby pins twist and pin your hair in a low messy bun. Messing Crème adds grip to a lived in 2nd-day style. Using the messing crème about a dime size amount, worked it into your hands and pull back your hair to get control of the fly-a-ways. Playable Texture lets you re-work your style and builds texture each time it’s used. When using playable texture you want to spray from the inside of your hair, lift up each section and spray inside to create that textured look. 2-in-1 Styling+Finishing Spray is used for adding shine onto dry hair, and also used as a heat protectant. Medium Hold Spray is a working spray which provides style memory & brushable hold, using both of the products you will be able to create a polished effortless look! Using MakeOver Spray only on the root and down the mid-shaft to absorb any access oils and build-up on your hair. Dry Touch-Up revives dry, over worked ends and adds a shine as if it were a dry conditioner. On my day 4 look I created just a normal braid. You can be creative and design a braid you have never tried before! Design Wax has a style memory, this product lets you rework your hair and help create your desired style. Dry Extreme Hairspray has a 24 hour hold with its anti-humidity resistance. To create day 5 style, use a pea size amount of Design Wax, worked it through your fingers and start a fishtail braid. Using bobby pins twist the braid into an updo style and pinned so it’s secure. For a finishing touch spray with the Dry Extreme Hairspray. Hopefully these tips and a little bit of product knowledge will help you create beautiful results without having to waste time! By Jen D! Call Aurelio Salon in Howell at 732-303-0052 or 732-551-2930 in Toms River New Jersey for more information about five different hair styles that give you a new look. Learn Some Beach Ready Makeup Tips! One of the biggest questions for summer is “How do I look good on the beach? !” Far too many factors play a role in removing your barely –there make up look. Thanks to the combination of Beauty Addicts Cosmetics and Dermalogica skin care, we have some tips to keep you looking beach ready instead beach wrecked. Coverage – sheer mineral tint with double deception concealer and pressed powder to absorb oil. Contour- hydra sun rays bronzer. Tip: try a lip color to make your lips pop, and use a natural shadow for a little shimmer without looking greasy or too done up for the beach. Coverage – skin perfect primer and double deception concealer. If more coverage is needed use some pressed powder to provide coverage. Tip: Do not use shimmery shadows or powders. They will draw attention to any wrinkles. Coverage- sheer mineral tint and double deception concealer. Tip: use a higher SPF to prevent any sunburn which can add to skin irritation. Green based concealers will also help counteract redness. Coverage- sheer mineral tint with pressed powder. Tip: Use a lighter concealer under eyes to brighten and enlighten complexion. Moisturizer- skin smoothing cream or intensive moisture balance. Coverage- skinperfect primer sheer mineral tint and double deception concealer. Tip: For dry patches, use intensive moisture balance to create an even skin complexion. Aurelio Salon along with Beauty Addicts has set the make-up trend for this summer! Into the BLUE incorporates blue shades for a natural look with pops of blue. Since the blue shadow typically gets and 80’s flashback with hot pink lipstick, I decided to show those who relate 80’s to blue shadow a way to make blue shades work. The key to making this look work is to neutralize your color selection allowing the blue to be the pop of color. Most of the colors used were neutral or peachy which complimented the hint of blue liner and shadow on our model’s eye. This look can be used on most eye colors and can be changed to be more complimenting to face shades. A darker skin color can use more blue since the dark pigment can take away from the vibrancy of the shade. K.I.S.S is the guide to follow: Keep it simple, Sweetie! Call Aurelio Salon in Howell at 732-303-0052 or 732-551-2930 in Toms River New Jersey for more information about summer makeup trends. Aurelio Salon is Awarded Titanium Status! Howell NJ- April 9, 2015 As Aurelio Salon gets ready for its Spring promotions it received fascistic news from Trevor Attenborough, the President & General Manager of KAO USA. KAO USA is the parent company of Goldwell and KMS California. In a letter dated February 25, 2015 He informed the Aurelio Salon that it achieved the coveted status of a Titanium Salon. Aurelio Salons Spring events include its March Guest Appreciation Days where Guest receive 20% off their chemical hair services, Prom Hair and Makeup Specials, and Its Kerasilk one Day Event. Aurelio Salon will be hosting a Titanium Celebration party on April 25th, at both locations. They invite Guests to stop in and receive a complimentary After Care Color Treatment, Free Take Home products, and Refreshments. Call Aurelio Salon in Howell at 732-303-0052 or 732-551-2930 in Toms River New Jersey for more information about achieving a Goldwell Titanium status award. Jessica Rivera a Stylist at Aurelio Salons Howell Location, had a guest, Jenna, that wanted a change from the ordinary to Bubble Gum Pink. When Jenna first came in she her hair was a Level 4-8 with a natural,new growth level 5. Here hair was in good condition. To get to the desired goal Jessica had to use 6 different formula then she had to get to work and these were the steps were she used. Call Aurelio Salon in Howell at 732-303-0052 or 732-551-2930 in Toms River New Jersey for more information about how to create bubble gum pink hair color. Want voluminous cascading hair? Here is the glamourous secret: taped in extensions! 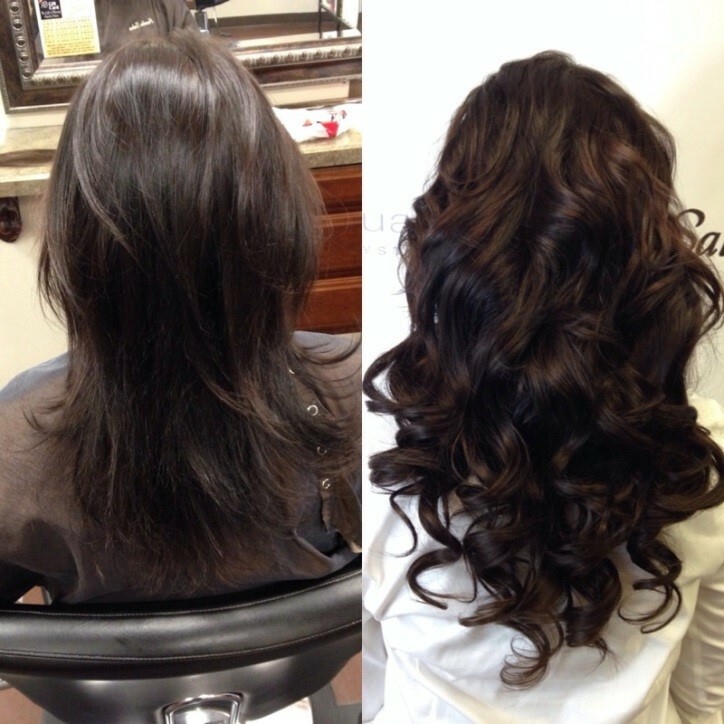 Extensions will provide you with body and or length. HOW IT WORKS! Section hair into quadrants, leaving the front out, and starting in the nape area of the head. Use your index and pointer finger to determine the width of hair to leave out of the hairline. After that, use your tail comb to take thin sections to same size of the tape. You will have approximately 15-20 strands of hair within each sandwich. Since each extension is sandwiched together and adhered by a piece of tape it allows your installation time to last a lot longer. Work your way up the back and sides of the head until it appears natural. In most cases you will have to angle and layer the extensions for a more blended look. Proceed to style your hair as you would your own, just be cautious of applying heat to the adhesive part of your extension at the root! Call Aurelio Salon in Howell at 732-303-0052 or 732-551-2930 in Toms River New Jersey for more information about how to create voluminous cascading hair. 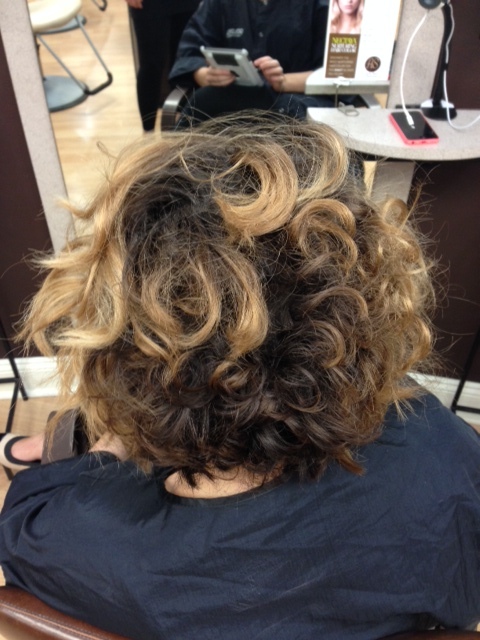 A client of Aurelio Salon came with a natural level 6 base color with some old highlights. The client wanted it brighter and “Freshened up”. After speaking with her stylist they went for a Sandy Bronze Color. To brighten her up her stylist used a lightener and when in to paint brighter pieces throughout her hair. Next she went in and used TopChic, a permanent hair color by Goldwell, and went in between her painted pieces to brighten up her base color. After the client was finished processing she glazed her with Colorance, demi-permanent hair color, that not only protects the hair, but even repairs the hair structure. to give her a beautiful sandy bronze. 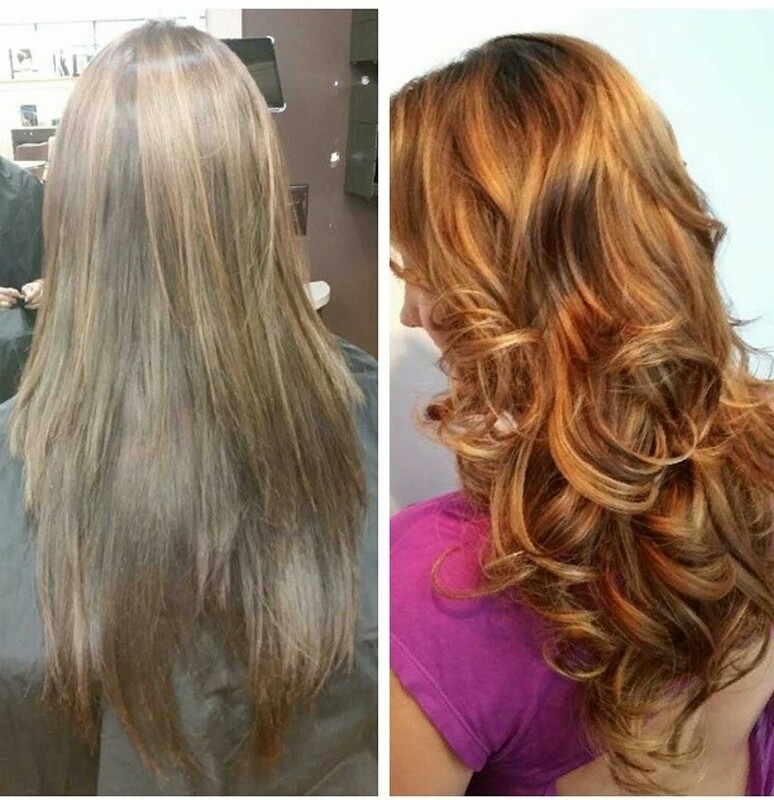 Call Aurelio Salon in Howell at 732-303-0052 or 732-551-2930 in Toms River New Jersey for more information about how to create a sandy blonde hair color. As the seasons change so too does your hair and scalp- this means rethinking your daily and weekly beauty routine. Rotating your shampoo can help to ensure the best results for your scalp and hairs health. The products you use or may be looking for have their own unique formula to treat certain conditions. When it is warmer we submerge our hair in the salty ocean and chemically treated water, as well as increase the use of lighteners to achieve that “sun-kissed” summer look; we alter our normal pH. Maintaining a healthy pH is more crucial than many believe. When the pH is off your hair will be more susceptible to damage or hair loss while your scalp may be more dry and sensitive leaving the possibility of dandruff or eczema as a side effect. Citric and tartaric acid both help to adjust the pH of your hair and scalp, bringing it closer to the 4.5-5.5 (the normal measurement of hair) state from the 7-9 either permanent color or bleach can leave you with or ocean water at 8.2. Shampoos that contain these ingredients from the KMS California line are the HairRemedy Sensitive Scalp shampoo, SilkSheen, HairPlay, MoistRepair, CurlUp, HairStay Clarifying shampoo, and FreeShape. 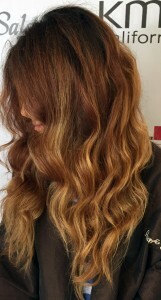 The sun is one of the leading causes in haircolor fading. Octinoxate and Peppermint are natural UV filters which help protect hair from the harsh sun’s rays and protect your color. MoistRepair, CurlUp, ColorVitality, and HairPlay are some of the shampoos you would use as a summer sun defense, depending on the current state of your hair. Chlorine is an enemy to light and blonde haircolor, during the summer a build-up from salt, minerals, even products can slightly alter any desired look. Tetrasodium EDTA and Sage Extract help to remove build-up from those factors as well as balance the hair. HairRemedy Sensitive Scalp Shampoo, HairStay Clarify Shampoo, HairPlay, CurlUp, and SilkSheen all contain those 2 key ingredients to help keep your hair feeling “squeaky clean”. The cold winter days don’t cause as much damage as it does dryness. While in the summer you need a little more protection, in the winter you’ll need more moisture. Glycerin and Wheat Flour both aid in replenishing and maintaining moisture levels; MoistRepair, CurlUp, and HairRemedy Sensitive Scalp Shampoo are your go-to and must-haves during that time. There are some scalp conditions that exist year round. 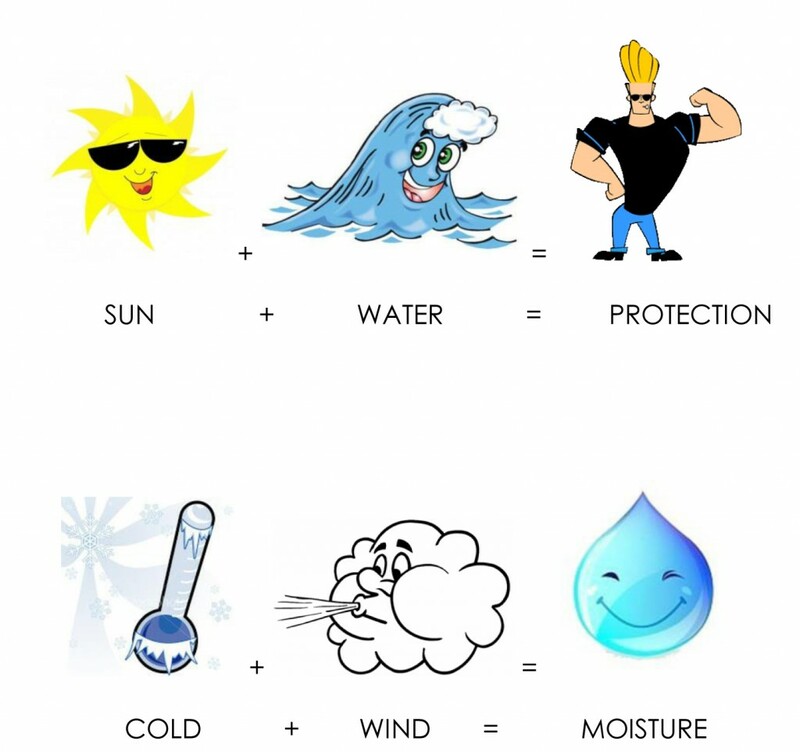 Dandruff and sensitive scalp could be caused from a sunburnt scalp, the dry cold air, or even genetics. Rosemary and Zinc Pyrithone are two ingredients that help fight against an itchy and flakey scalp. HairRemedy Sensitive and Dandruff shampoo can both be added into your weekly cleansing regimen regardless of the time of year to ensure your scalp is healthy and flake free. Call Aurelio Salon in Howell at 732-303-0052 or 732-551-2930 in Toms River New Jersey for more information about how to help your hair and scalp adjust to the changing of the seasons.